Consumer choice of a particular type of retail outlet greatly depends on the consumer values that the outlet provides. 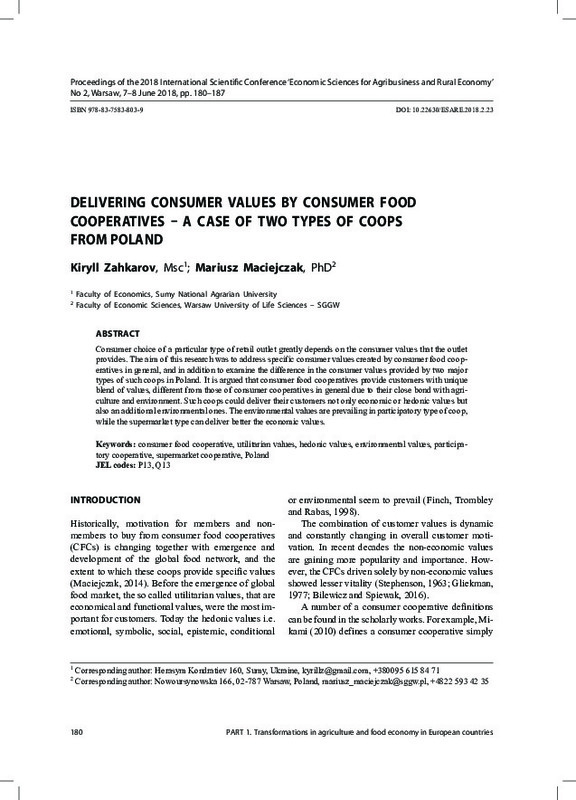 The aim of this research was to address specific consumer values created by consumer food cooperatives in general, and in addition to examine the difference in the consumer values provided by two major types of such coops in Poland. It is argued that consumer food cooperatives provide customers with unique blend of values, different from those of consumer cooperatives in general due to their close bond with agriculture and environment. Such coops could deliver their customers not only economic or hedonic values but also an additional environmental ones. The environmental values are prevailing in participatory type of coop, while the supermarket type can deliver better the economic values.